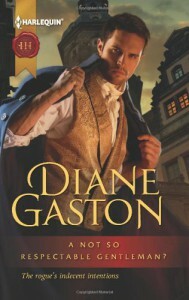 A Not So Respectable Gentleman is an enjoyable historical romance. It brings a little bit of mystery, some misunderstandings, and a hero who works to be redeemed in his ladies eyes. The plot is well laid out and the characters full of wounded emotions. Leo is a great hero, wanting to aid the woman he believes tossed him over for a titled gentleman. It is nice that Leo and Mariel figure out the miscommunication that occurred early on in the book, then they can get on with moving past it and opening up to future possibilities. While fun to read it was a little bogged down in the middle, the pace slowed and the characters were at the point of move on or give up. Still, good enough to spend a few hours reading some afternoon.